We can generate and deliver sub prime and prime auto finance leads to your business office, our lead quality is among the best in the industry, Our leads are 100% exclusive and the quality is guaranteed, we will gladly replace any invalid leads that may have slipped through the cracks. It doesnt matter whether your dealership calls them sub prime leads, auto finance leads or special finance leads they are all the same, what matters is that these leads are the key to many successful sub prime departments at dealerships across the country. Our leads are 100% exclusive which means they are never shared or resold to any other dealers. We are also pleased to offer a No Minimum, No Contract and No Obligation Service, Buy the amount of leads you need, when you need it. We are the only provider that Telephone Verifies up to 90% of your leads, to ensure the highest quality and the best possible closing ratio..
We stand behind our leads, Quality Guaranteed - Buy sub prime leads for your dealership with confidence. Get up to 20% discount off regular lead prices. The membership fee is ONLY $69.95 per month for a limited time. Forward applications to business office via fax, email or website plus. Benefits: This plan enables your dealership to capture and secure more online business, by handling the most time consuming and confusing part of the process for you. Business mangers will get applications forwarded to them in "ready to submit" condition therefore eliminating the additional time usually needed to verify the clients information. In addition your clients will appreciate the telephone contact as well as the email sent to them assuring them that someone is working hard to secure them a loan approval. Benefits: This plan offers the added benefit of knowing your clients credit worthiness by getting a snapshot of there credit history via their credit score while still offering the benefits that enables your dealership to capture and secure more online business, by handling the most time consuming and confusing part of the process for you. Business mangers will get applications forwarded to them in "ready to submit" condition therefore eliminating the additional time usually needed to verify the clients information. Benefits: : This is the plan of choice for business managers who may have not yet acquired the credit experience required to know what lenders are looking for or for the business managers who simply do not have the time to try to figure the best course of action for a certain application. 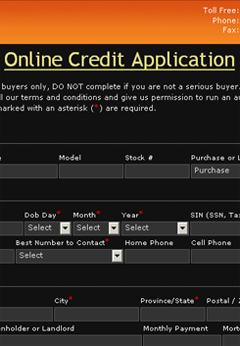 This plan still offers the added benefit of knowing your clients credit worthiness by getting a snapshot of there credit history via their credit score but now it includes lender recommendations and prime/sub prime approval ratings, while still offering the benefits that enables your dealership to capture and secure more online business, by handling the most time consuming and confusing part of the process for you. Business mangers will get applications forwarded to them in "ready to submit" condition therefore eliminating the additional time usually needed to verify the clients information. Benefits: : This plan enables your dealership to capture and secure more online business, by handling the most time consuming and confusing part of the process for you. Your broker of choice will get applications forwarded to them in "ready to submit" condition along with information about the vehicle of interest therefore enabling your broker to process your deal in the same manner as if your client walked in and filled of an application and you faxed it to them. You as a dealer will have access to see which applications were forwarded to your broker which enables you to follow up on your online deals. You will also be able to reprint and send your application to another broker if necessary. Benefits: : The name of this plan pretty much sums it up, by selecting this plan you as a dealer puts the responsibility of getting your online clients approved in our hands. We will handle the process from application receipt to processing to approval/signing, you will simply provide vehicle details and perform your normal sales duties such providing safety certificates etc. You will see an increase in sales as your dealership starts to take advantage the online application aspect of the business. Just sit back relax and have us help sell more each month. ZERO DEDUCTIBLE: This warranty is a zero deductible warranty. ENGINE: The following internally lubricated parts (when damaged from within) including: engine block, cylinder heads, crankshaft and main bearings, crankshaft gears, connecting rods and bearings, camshafts and bearings, camshaft gears, push rods, pistons, rings and pins, intake and exhaust valves, valve springs and retainers, valve covers, guides, lifters, rocker arms, shafts and pivots, timing chain or belts, timing belt tensioners and guides, oil pump and shaft, dip stick and tube. TRANSMISSION/TRANSAXLE: (a) Automatic The following internally lubricated parts (when damaged from within) including: housing, torque converter, valve body, gear sets, main and intermediate shafts, clutches and bands, vacuum modulator, oil pump, oil pan. Excluded: External linkages and shifter. (b) Standard The following internally lubricated parts (when damaged from within) including: housing,main and intermediate shafts, gear sets, synchronizer rings, shifter fork and bearings. Excluded: manual clutch, pressure plate, clutch bearing, external linkages and shifter. DIFFERENTIAL: (a) Front Wheel Drive Vehicles (transaxle)(wheel bearings are not covered). All internally lubricated parts (when damaged from within) including: housing, main shafts, crown and pinion and pinion gears. (b) Rear Wheel Drive Vehicles (differential)(wheel bearings are not covered). All internally lubricated parts (when damaged from within) including: housing, carrier gear and case, drive pinion and pinion gear, ring gear, differential cover, differential mounts. $1000 PER CLAIM: Nationwide Auto Warranty will pay up to $1000 per claim with a maximum total liability to the purchase price of the covered vehicle. MAJOR SEALS & GASKETS: Coverage includes only those seals and gaskets listed as follows: cylinder head gasket(s), intake manifold gaskets, front and rear transmission seals,pinion seal and axle seals. Please note: "seepage" or "sweating" is not covered as this is considered normal and acceptable. Minor leaks to above seals or gaskets are considered normal, and will not be considered as a claim, unless causing engine or transmission to operate below standards. 4 X 4 or AWD : internally lubricated parts (when damaged from within) including: case, gears and sprockets, chain mounts. SUPERCHARGER / TURBOCHARGER : Turbocharger - All internal parts including: housing, waste gate controller, intercooler and hardlines. (NOTE: Turbocharged engines must use turbo-rated oil.) Supercharger - All internal parts including: housing, compressor, clutch and pulley, by-pass valve, intercooler and ducting. ROADSIDE ASSISTANCE : NAW will reimburse up to $50. per occurrence to a maximum of $250: Winching service, Battery boosting service, Emergency fuel delivery, Flat tire service and Vehicle entry service (locksmith services). TOWING :NAW shall reimburse the customer up to a maximum of $50. per occurrence for towing expenses incurred due to a breakdown covered in this Agreement. A valid towing receipt must be submitted for reimbursement. $2500 PER CLAIM :Nationwide Auto Warranty will pay up to $2500 per claim with a maximum total liability to the purchase price of the covered vehicle. AIR CONDITIONING (Major Component): Compressor, clutch assembly and pulley, condenser, evaporator and accumulator. (Seals are not covered) NAW shall reimburse the customer up to a maximum of $50. per occurrence for towing expenses incurred due to a breakdown covered in this Agreement. A valid towing receipt must be submitted for reimbursement. CAR RENTAL: NAW shall reimburse the Customer for car rental expenses incurred due to a breakdown covered under this Agreement. TRIP INTERRUPTION: NAW shall reimburse the Customer up to $150. maximum with a $50. maximum per day for lodging, meals, bus or taxi, if a Customer is more than 150 kilometres away from home (one way) and an authorized NAW Repair Centre cannot provide "same day" emergency service covered under this Agreement. Valid receipts will be required for reimbursement. STERRING SYSTEM: Rack and pinion, power steering pump and pulley, fluid reservoir, hydraulic lines, steering gear, main and intermediate shafts, pitman arms, idler arms, centre link, steering knuckles (spindles), kingpins and bushings, cooler and lines. BRAKING SYSTEM: Master cylinder, assist booster, proportioning valves, wheel cylinders vacuum plates and return springs, front and rear calipers, hard lines and fittings, fles lines, brake linkages and cables. $3,500 PER CLAIM : Nationwide Auto Warranty will pay up to $3500 per claim with a maximum total liability to the purchase price of the covered vehicle.